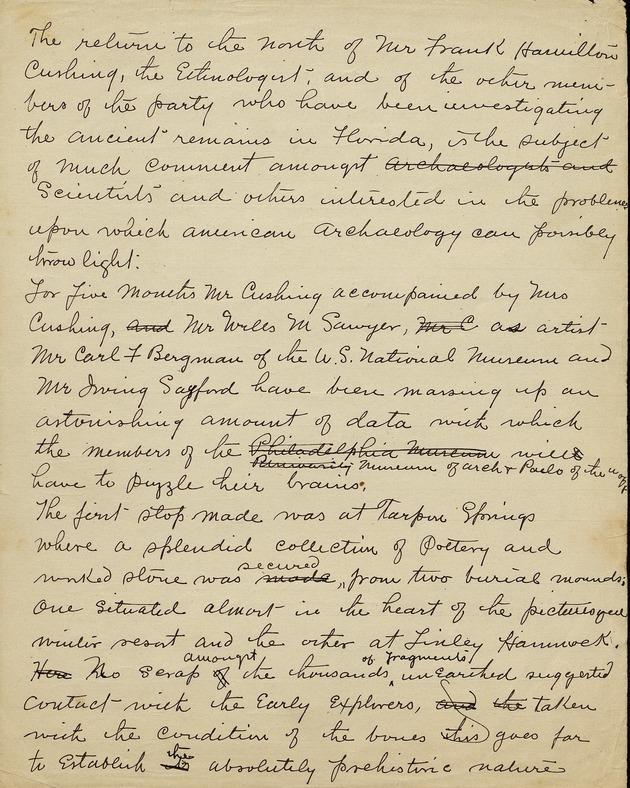 Correspondence, drawings, and other papers related to Wells M. Sawyer's life, travels, and the 1895-1897 Pepper-Hearst Expedition in Florida. This collection contains Wells M. Sawyer's personal correspondence, photographs, drawings (including sketches on several of the letters), watercolors, news clippings, and notes and other materials pertaining to the Pepper-Hearst Expedition of 1896. This collection is useful to researchers interested in the life and artistic career of Sawyer, particularly his role as a member of Pepper-Hearst Expedition. Although the collection spans his entire life and covers many important events, the collection is not comprehensive and has numerous gaps. For example, Sawyer's sketches primarily date from his later travels (circa 1920-1947), and there are only two examples of his watercolors. His personal correspondence includes photocopies and transcriptions of original and duplicate copies, and some pages are missing from the correspondence. The Pepper-Hearst Expedition papers primarily consist of Sawyer's own draft report on the expedition, as well as his correspondence, and field notes. The folders also include a few Frank Hamilton Cushing letters and newspaper clippings. One folder contains a catalog of the photographs that Sawyer took on the expedition (the actual negatives are kept at the Smithsonian Institute and are not present in the University of Florida collection). Additionally, some photographs mentioned in the Pepper-Hearst correspondence are not enclosed with the corresponding letter and are not in the collection. The papers are organized alphabetically by subject, and the sketches and watercolors are organized according to a numeric identification scheme. Wells Moses Sawyer was born on January 31, 1863 to Moses Calvin Sawyer and Helen Jane Cass Sawyer in Keokuk, Iowa. Sawyer acquired a law degree in 1882, but he never practiced law. While studying law in Chicago, he began pursuing his career as an artist when he took art courses under John Vanderpoel at the Art Institute of Chicago. Sawyer had several types of employment throughout his life including working as an illustrator for leading newspapers such as the Chicago Daily News and the Chicago Tribune, and later in life he held the secretaryship of the Trustee Securities Company. Sawyer's position as a Paleontologic Draughtsman for the U.S. Geological Survey office in Washington D.C. enabled him to join Frank H. Cushing's Pepper-Hearst Expedition to Tarpon Springs and Key Marco in Florida in 1896. A controversial aspect of the expedition regarded the artifacts that the archeologists and diggers removed from the pre-historic mud mounds in the region. Upon their removal, the artifacts quickly faded and deteriorated in the sunlight. Consequently, Sawyer's original photographs and sketches of the artifacts made soon after the digging became even more important to the artifact documentation and historical significance of the expedition. Sawyer married Kathleen Bailey upon returning from Florida, and they subsequently had two children, Helen and Bailey (Bill). The family lived in New York, but later in life Sawyer retired due to health issues and moved to Spain with his wife. They traveled throughout Europe, as well as in Central and South America. Sawyer began to sketch and paint more in his retirement, and he had many exhibitions in both Spain and the U.S. Sawyer and his wife made a final move to Sarasota, Florida, in 1944. He continued to show his artwork in Spain, Mexico, England, and the United States, and was a member of the Art Students League, Salmagundi Club, and the American Watercolor Society. He died on March 21, 1960. Identification of item, Wells M. Sawyer Collection, Special and Area Studies Collections, George A. Smathers Libraries, University of Florida, Gainesville, Florida. The collection is open for research. Some of the Pepper-Hearst Expedition notes and larger sketches are extremely fragile and need to be handled with care. Please consult a staff member for handling these fragile materials. 5 V ,t-. ..A. .. . i4 .... iy 4 t d V. .
o ^ ^ ... ,.-. : i.. ^ ^ .^ ... ^ ,. _ .
'" ^U^ '('I/ ^L* ^ '^^~-v^ iQ^i ^L~Lei^ T~~~ f CUL :. CLt a- A-<.e-6 I6 flkL (r .
,, -^ ^ ,,;-. -, tA<. .__. ^r-v ,k^ ,,<<^< OL^C<<_ /^^c ~ -'^ ^(--^~ --<^ ^ . ?